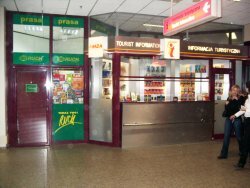 How to get to the Warsaw City Center from the airport with a video and instructions. Currently there are three main ways to get from the Warsaw airport to the Warsaw city center (Centrum). That is either by bus, by cab or train. This assumes, of course, that the hotel at which you are staying, if you are staying at a hotel in Warsaw, does not have available a customer service bus. If it has a customer service bus, by all means avail yourself of its services. To the left is a video showing the train connection. The Warsaw City Center is probably best described as that area around the Palace of Culture and that includes the Warsaw Central Train Station And The Warsaw Central Metro Station. They are less than 1 km apart but are two distinct areas. We have a more complete description of the Warsaw City Center plus a video describing it at Warsaw City Center, Poland. Do note that there are Limousine airport transfer services available that will make things much. much easier for you. Information about Limousines is at Limousine services. If you wish to go to the central station, there is a video below that takes you on an actual trip. A copy of the video is below and a copy is on YouTube at Warsaw Airport To Central Train Station The video will open in another window so that you do not leave this page. If you wish to use a cab to get from the Warsaw Airport to the City Center, here is a video and information about taking a taxi from the Warsaw Airport. We do hope that this page on How To Get To Warsaw City Center From The Airport has helped. To bookmark or link to this site, use How To Get From The Warsaw Airport To The City Center.